I would like to express my sincere appreciation for having the chance to be your Concierge Family Doctor. I hope your experience in my new practice has surpassed your expectations and that you have been pleased with the services my staff and I have provided you. My office and I appreciate the confidence you have shown in selecting myself and my practice and will continue to provide you with the highest quality service along with quality health care. 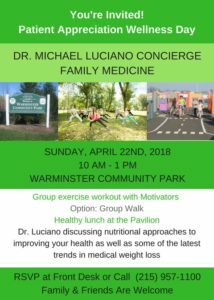 As a thank you to you, I am planning a Patient Appreciation Day on Sunday, April 22nd from 10 am – 1 pm at Warminster Community Park for a group exercise workout (walk optional) followed by a healthy lunch at the Pavilion. The group workout will be run by Dan Alexa and his wife from Motivators, Huntingdon Valley. As you already know, I believe in living a healthy lifestyle that includes healthy eating and regular exercise as a proactive approach to wellness. In a recent special issue of TIME magazine, “The Science of Exercise”, it discussed how exercise can be used as medicine for even the sickest people, prevent diseases such as Alzheimer’s, reduces depression, improves memory, slows down the aging process, and offer many other health benefits. I hope you will join myself and the staff from the office to enjoy a morning of wellness and community. Family and friends are welcome. Again, thank you for choosing myself and the practice for your healthcare needs.